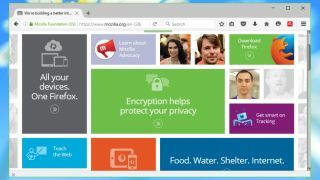 The browser world is a fiercely fought arena, and Firefox is about to make a move in order to become more competitive with rivals like Chrome, planning to draft across some of the privacy settings seen in the Tor browser. The Tor browser is actually based on the same code as Firefox (Firefox ESR, which stands for Extended Support Release), and bounces communications through numerous encrypted nodes on the net, meaning the user can't be traced, and generally maintaining privacy (and security) to high levels. According to Ghacks, Mozilla is planning to integrate some of these privacy-preserving tricks into Firefox, with several basic features already in version 50 of the browser (which is in preview). These will eventually emerge with the full release version of Firefox 50, with plans to incorporate further measures in the future. All in all, the result will be a much tighter browser when it comes to avoiding online snooping of one sort or another. Ghacks notes that these features won't run by default in Firefox, observing that the Tor-specific settings aren't really appropriate for the mainstream audience of Mozilla's browser. Rather, those seeking greater privacy protection will have to turn the options on manually. As well as bolstering privacy, Firefox is also aiming to run more smoothly, with the recent unveiling of another fresh incoming feature by the name of Electrolysis. This effectively splits Firefox into a UI process and content process, meaning that if a web page crashes or is eating up CPU resources, because it's running separately, the browser itself will remain fully responsive.